TVR GRANTURA MK I 1958 - 3RD OLDEST SURVIVING CAR ! TVR founder Trevor Wilkinson did not start series production with what became known as the Grantura until 1958 - so this is a very early TVR indeed. How early was discovered as the chassis number was 112 - with Grantura production only starting at 101 this was the twelfth off the line and, according to the register, the third oldest known survivor. The car is declared manufactured in 1959 on the V5, but it is believed it may actually be from 1958 as the chassis plate bears the name TVR Engineering Ltd, Wilkinson's original company; a firm which was wound up at the end of 1958 with subsequent cars being sold under the Layton Sports Cars Ltd name. 650 KTF's history is fascinating and is on the market for the 2nd time in 40 years or so, having been purchased from the estate of the late owner. Luckily he wrote down its complete story in a 26 page document that resides within the history file. He acquired the car in 1971 as a rolling chassis, minus engine, and separate damaged body. It had been bought in Blackpool by a friend who had an accident near Perth on the way home, badly damaging the rear bodywork and bonnet. It was repaired with a slightly later back half, which explains the detail differences to the MkI, as can be seen on the car today. The Grantura was moved from home to home over the next fifteen years with sporadic restoration work being carried out. Then the owner resolved to complete it after passing his 40th birthday, commenting, If I don't finish it soon I won't be able to get in it! There are detailed notes on the restoration, which included fitting a rebuilt Ford 1340cc pre-crossflow engine of the type used on the Grantura MkIIa. This was one of several engine options available to Grantura owners over the years and a huge improvement on the Ford side valve it would have had originally. One of the most exciting parts of the car is its re- trimmed interior, including the original TVR bonnet badge and the Grantura steering wheel; these wheels are very rare items indeed! The chassis is in excellent condition and the wire wheels are superb and shod with a matching set of new Firestone tyres. The car has also had the benefit from a recent total re-paint. 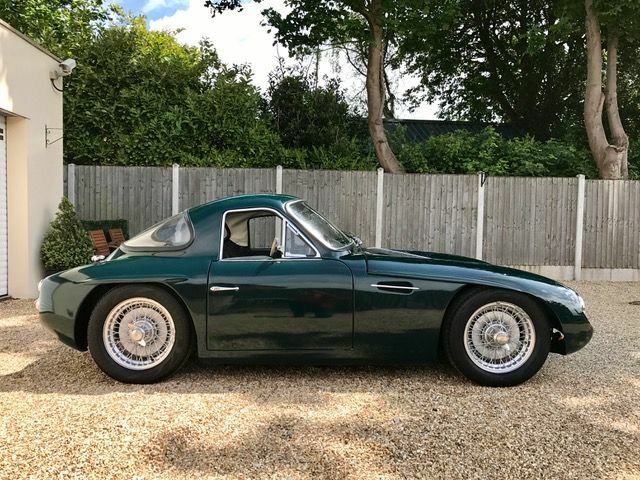 This TVR is also offered with a genuine Mk.I Grantura rear body tub, so it could be returned to full 1958/9 specification if desired. The doors are tiny, so getting in is for the slim and agile and headroom is very limited. Once in it is a very snug and pleasant environment, with excellent grip from those period 1950's bucket seats. Performance is lively and the gearbox has a lovely mechanical short throw, while the massive 11 drum brakes - from the Healey 100-6 - have no trouble stopping such a light car. The steering is direct and precise and the front suspension is as firm as all the books say - one of the reasons the Grantura was (and remains) so popular for competition work. So there you have it: a rare and historically important TVR, with great history and in superb order throughout thats ready to adorn any collection as well as being a wonderful slice of Classic British motoring history. PROMISE NO DISAPPOINTMENTS.